After a horrible start in Montcada, I was at 50% after four rounds. The second half of the tournament was a little better than the first, but that’s not saying much. In round 5, I got my second black in a row against Jonathan Cruz (2437, Colombia). I didn’t find a lot of his games in the database, but he generally seemed to pick the sharp main lines. Thus, I was a bit surprised when he went for the 6.e3 variation of the Slav. Everything in his past games seemed to point to him repeating 6.Ne5, but I guess he had prepared something himself. We had been repeating with …Na7-c6-a7 and Nc3-e2-c3 the past couple moves, and this was a chance for a three-time repetition. I was down to about 3 minutes at this point to reach move 40 (along with a 30-second increment). I was tempted to play on, with 33…Qd8, hitting both h4 and a5. I’m not quite sure what I was afraid of now, as 34.f5 gxf5 35.gxf5 Bxh4 nets a pawn (White can’t take on e6, because after the mass exchange on f3, the bishop on e1 hangs). 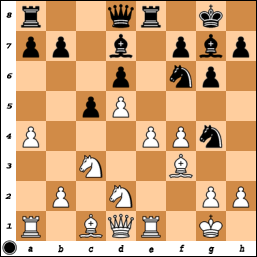 White has some compensation after 36.Bd2, but Black is definitely playing for a win. Meanwhile, on 35.h5 gxh5 36.gxh5, I remember thinking my position was quite pleasant after 36…Nc6. I think normally I would have played on here even if I thought the position was equal (after all, I’ve played on in much worse positions, and with less time! ), but maybe because of my prior blunders, I decided not to tempt fate in time pressure and just repeated. The strange thing was that when I offered him a draw before finishing out the 3rd repetition, he declined and said it wasn’t 3 times. I was a bit confused by this, but instead of letting my clock run to zero, I just wrote my move down and claimed the draw. The arbiter duly verified the claim. If you look at the pieces from the 2nd rank to the 7th, it almost looks like something that would come out of a Chess960 opening, but no, this game started with the usual arrangement of pieces and 1.d4. During the game, I thought I was a little better now, while after the game, he thought he was doing fine here. Back in April, I made my summer plans and decided to play a series of tournaments in Spain. Rather than jump around from country to country, packing and repacking, and passing through security checkpoints every week, I decided to essentially stay in one place. This is something of a change for me on these long trips. As often as I have played in Spain, I actually haven’t played more than 2 events at one stretch in the Catalonian Circuit before. The first stop on this tour was Montcada, which is a small town just outside of Barcelona. It’s not traditionally a super-strong event, but it is a Category A tournament for the purposes of the Catalonian Circuit, and the field is generally small enough that you can play a number of good players. This year, Lazaro Bruzon (2668 FIDE) was the top seed, but after that, I was #2 at 2547. Still, there were only 40 players and the average rating of the entire field was in the high 2300s. I ended up with only 5/9, but the tournament started off as a veritable disaster. I was completely lost against a 2420 in 12 moves, and then followed that up by achieving a lost position against a 2344 in 15 moves! I just played 12…Bg7xe5, which pretty much loses by force. I could have struggled on with 12…0-0, but then I was worried about 13.Qh4 (still, this was by far the best option). The weird thing was that I could have stopped 12.Be2-g4, and while I recognized it was his threat, I decided to do nothing about it! After 12…Bxe5 13.Bf4, it’s all over for Black. The game continued 13…Bxf4 14.Rxf4 c4+ 15.Kh1 Bxg4 (15…0-0 16.Qh4 h5 17.Bxh5 is curtains) 16.Qxg4 f5 (16…Ne5 17.Re1 f6 18.Nxh7! 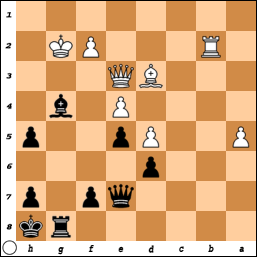 wins) 17.Re1+ Kd8 (17…Kf8 18.Rxf5+ wins) 18.Nf7+ Kc8 19.Qf3 and Black is toast. Amazingly, this game made it to the front page of ajedreznd.com as the game of the tournament. Really?! In any case, on to the next disaster. I got up from the board here, feeling quite happy with myself as I thought my opponent had just played a horrible Benoni. Of course I saw 15…Nxe4, but I thought that after 16.Ncxe4 Bd4+ 17.Kh1 Qh4, I had either 18.Bxg4 Bxg4 19.Nf3 or 18.h3 at my disposal. When I returned to the board, he had played 15…Nxe4!, and when we reached the position after 17…Qh4, I realized that on 18.Bxg4 Bxg4 19.Nf3, Black has 19…Bxf3 20.gxf3 (not 20.Qxf3 Qxe1 and mate) f5 21.Ng3 Bf2! 22.Rxe8+ Rxe8 23.Kg2 Re1!. Black plays 24…Rg1+ next and wins. Uh oh. But ok, I still have 18.h3, right? Nope – after 18…Nf2+! 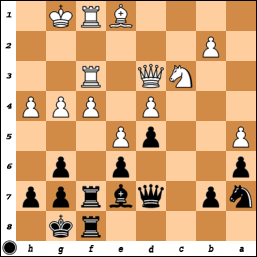 19.Nxf2 Bxf2, Black threatens to invade on e1 and to take on h3, with a rather strong attack. Thanks for playing. Better luck next time. I did manage to crawl back to 2/4, but it wasn’t easy. When you’re playing badly, the wins are hard to come by and the losses happen only too easily. The second of those wins came with the black pieces, against a young 2199 player who was having a pretty good event up until then. A tough, strategic Ruy Lopez battle became a bit sharper as we made it to the first time control, and I just played 40…Rc8-g8. I thought I was in great shape here, as I didn’t see how he’d be able to shelter his king. But after 41.Kf1 Qh4 42.Ke1, I realized it’s not so easy to get into White’s position. Meanwhile, the passed a-pawn is a real menace as I can’t really turn my attention to that side of the board. If I do, White might try and invade with his queen on h6 or g5, not to mention the fact that putting a rook on a8 doesn’t actually do anything, as I can never move it off the 8th rank because of Rb8+ and Qg5#. 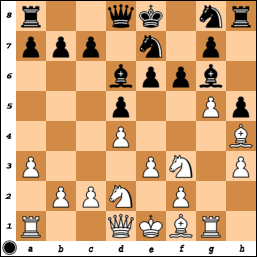 After a long think, I came up with the best move in the position – 43…h4!. Black uses his own passed pawn to cause some problems. 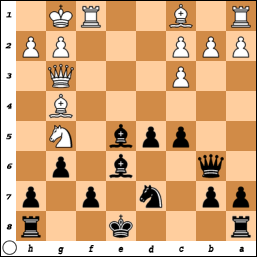 In a strict pawn race, Black wins – 44.a6 h3 47.a7 h2 48.Rb8 Qxf1+! 49.Kxf1 h1=Q#. However, White can throw in f2-f3 at some point to open the 2nd rank for his rook. Luckily, he went wrong with 44.Rb7?, and after 44…h3 45.f3 Bc8! 46.Qh6 Qxf3 47.Rb3 Qxe4+, White’s position completely falls apart. Had he found 44.a6 h3 47.f3!, though, I would have had to work much harder to win the game.